Though we hate to admit it, the truth is that there are no slot machine strategies that will make you a long term winner at the slot machines. Here only Lady Luck runs the whole show. But still there are some basic recommendations that will help you to increase your winning rate. The odds are always in the casino’s favor regardless of the strategies, tips and recommendations you use. Don’t expect to win all the time, it will only lead to frustration and as a sequence to bad moves. Try to consider losses as a part of the experience. Slots should be fun. If you're frustrated and panicky, walk away. Unfortunately, online gambling isn't legal everywhere; check out the legality of online casino activity for your country, state, province, or region before you play. 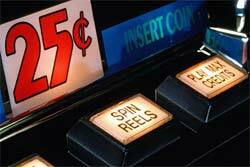 Pick a slot machine that suits your bankroll. The higher is the bet you make, in comparison to your budget, the sooner it will be time to end up the game. Remember, mathematical slot machine strategies are successful for a reason and casino games are based on probabilities and percentages. Successful players despite the public opinion aren't the 'luckiest' people around. A solid grasp of the odds and probabilities will bring far more success than any misplaced reliance on 'luck'. 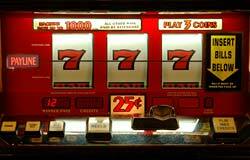 Similar to other casino games, it is crucial to know the odds and probabilities of the machine you're playing. Make sure you know the payout schedule before you start pumping in your virtual coins. Try to understand the concept of pay lines. Some machines can have as much as 25 pay lines. You should understand that in such cases it is not enough to play max coins. If you play max coins on one pay line out of 5, you will not win the biggest payouts or the progressive jackpot. In order to hit the largest payouts possible, you must play not only max coins but also max pay lines. Obviously, this will cost more, so you need to adjust the coin nomination even further downwards. Playing online affords you the opportunity not to hasten. Take advantage of this occasion to formulate wise decisions. Each casino has different rules for each game and often offers the same game under various sets of rules. Always look for the games with rules best suited to your preferences and your advantage. Strategies based on mathematics and probabilities will serve you better than any 'betting systems' developed by some local know-it-all. Hold on to proven strategies and stay away from unproven schemes.